Today, much of the main floor of Castel del Piano‘s Palazzo Nerucci is used as an art gallery with works that rival those found in some of the most prestigious galleries in Florence and Rome. Sourced mainly from private collectors, the works are mostly by Renaissance artists, but they cover a significant and diverse range of subjects and landscapes, and all perfectly complement the regal grandeur of the palazzo itself. There’s a portrait of Cosimo de’ Medici in his prime, a strikingly detailed outline of a woman’s hand embroided on silk, and a sketch of Giuseppe Nicolo Nasini. 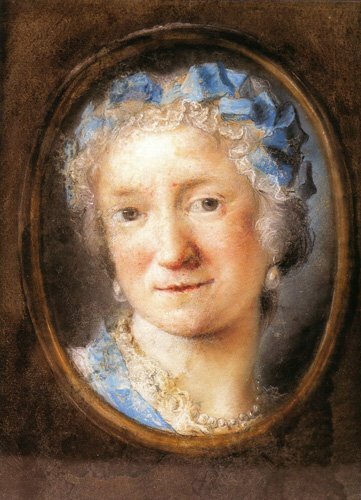 But as beautiful as these works are, there’s one painting that draws more visitors alone than all the other pieces put together – a self-portrait of Venetian artist Rosalba Carriera (1675-1757) seen above. Delicately painted with pastels, it is of considerable value and above all absolute splendour.